Take this opportunity to enjoy a great Madrid experience during this 4-hour private tour of the Madrid’s Retiro Park with your own guide. Enjoy a great walking experience to learn the story of Madrid and the Retiro Park. It is an amazing park that is known as the lungs of Madrid and the city's icon. If your hotel is walking distance, then there will be hotel pickup and drop-off included. Enjoy this private 4-hour tour with your official your guide and get to know Madrid’s most emblematic park. You can choose between a morning or afternoon departure directly from your hotel or place of choice. You are able to personalize each tour just by contacting us. Here is an example of a great and complete tour, although we will usually create the tour taking your hotel departure location into account. The tour will depart from central Madrid or at your hotel if it is walking distance from where you will meet with your private official tour guide. You will be able to discover along with your guide the centuries of history that Madrid has to offer in its amazing and huge Retiro Park. 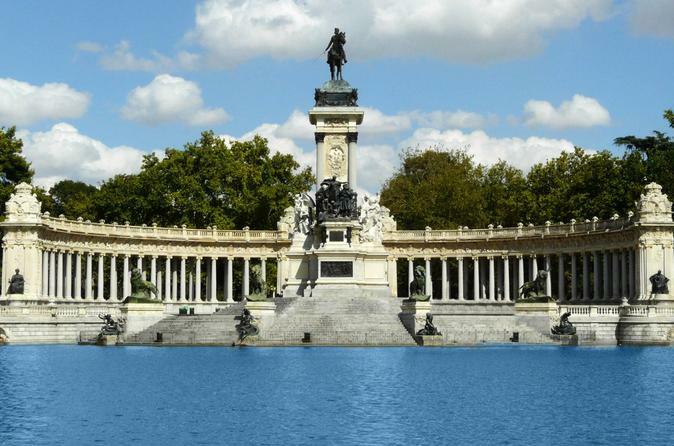 You will enjoy a gentle walk through the enormous Retiro Park of Madrid. You will enjoy its 350 sq. acres in the center of a capital city like Madrid. It is a must when you come to Madrid. Its great landscapes and sites will make your experience memorable. You will even be able to see the oldest tree in Madrid and much more. A highly recommended stop when you visit Madrid. Your tour concludes in the Retiro Park or at your hotel if it is walking distance. You will be able to take impressive pictures whenever you want. This is a completely personalized unique tour for you and your party.